Friday and Saturday moved so quickly and so late that I barely had a chance to recover. Even tho the nights werent insanely late, the subways always made it that much more fun. The best set of the festival – hands down – nothing came even remotely close – was Casiokidsfrom Norway (I actually thought Swedes, but alas theyre Norwegian). 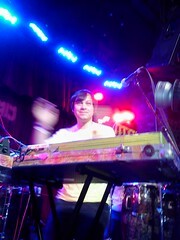 Casiokids were fun and creative and did I say fun. Their synth-pop/electronic sound was fresh sounding and it always felt like they were creating music on the fly. Who knows if they were – but it all seemed so original. I loved the fluidity of the band members as they all rotated on instruments from guitars to keyboards to drums. Well the drummer was usually one guy, but lots of percussion was always added – often times in the way of fruits. Shaking pineapples and red peppers. I think there was a cucumber too. The band had everyone clapping and dancing and just having a great time. It was a pity the set had to end as it should have gone on for at least another hour. 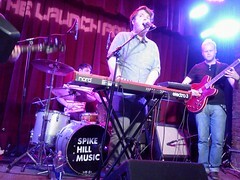 Thanks to Spike Hill for having one of the best showcases and free too! Its hard to go wrong with that. The UK had some great bands around too. Its pretty hard to go wrong with bands from across the pond (as a generalization – not a rule). 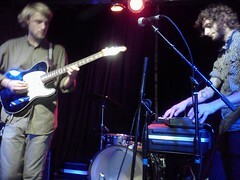 Jonquil, from the hometown of Radiohead, err Oxford, were a catchy 4 piece. They have a great indie pop sound with infectious hooks and catchy melodies. Their music has a sound that is quite reminiscent of Vampire Weekend. For great britpop, this band is definitely the way to go. The guys were cute and talkative and I could see them getting quite big. vocals they were a surprise that I couldnt get enough of. I really liked the set with the drummer grabbing part of the drum set and sitting in the middle of the floor. He was then joined by the bassist who went towards the back and the singer who joined in. It was so impromptu and spur of the moment. They all then had one hell of a session with drums culminating in a spastic fun set. And with all things UK – it would be hard to omit the lovely boredish lads of Viva Brother. They ended up being a surprise guest and they never seem to disappont live. Their music is energetic and has the feel of the 90s britpop bands. Unfortunately, the band just didnt seem as into it. The drummer seemed pissed, the guitars were somehow not on the stage but in the front of the stage in the audience. Their poor tech had to go back and forth giving people instruments. Im not sure if their set didnt play out as well due to a lack of sound checks. Their music is still damn great tho, so no matter how they looked on stage it was hard not to enjoy it. A bit sad that it was so short, but hell it was free and one awesome surprise. sitting out on a beach and just in your own place grooving out. Its gotta be the catchiest song out there right now. I could listen to them over and over. Billy McCarthy has since moved on from Pela (very sad!) to form We Are Augustines. I had wondered why this band kept emailing me new things, but that explained it all. I really didnt pay that much attention and had liked their stuff but seeing them live solidified it all. Rock music at its finest and a band that loves to play for fans. What more could anyone want. When told they had one last song, Billy went with a 10 minute jam that was purely awesome. Lots of guitars and rocking out they were easily a favorite of the night. Bands that left a lot to be desired: Fallulah from Denmark. Im not sure which was worse the Yeah Yeah Yeahs cover in which she stated they were her favorite band. Or the fact that maybe she wanted to be Karen O. Im not entirely sure, but I found them pretty unbearable. The band itself was interesting but her as a front woman made me cringe. 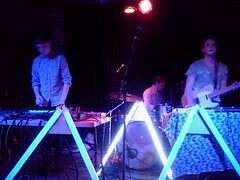 Chrome Sparks, from Michigan and California, just seemed a bit young and odd. Their music sounded ok, but the woman singing just seemed bored and not really into the show. And their music was a tad bit boring. Enough to stand around for 20 minutes, but thankfully it wasnt longer than that. Ambassadors, who I appreciated a bit more knowing their keyboard player was blind, had some great songs. Overall, I find their music hit and miss. Some stuff is incredibly catchy while others just dont seem to go with the sound. Savoir Adore is already a pretty big name here and they never disappoint. One of the last bands of the day they were a fun set with catchy songs and toe tapping and just leave you feeling in great spirits. Its hard to ever go wrong with them. The guy/girl vocals always work so well and a few mess-ups and laughter ensued. All in all, maybe Im getting more selective with what I go see, but for the most part there were some great bands that really stood out. CMJ was yet another success!